Last year I learned there’s no better way to get to know a place than to ride through it on a bicycle. 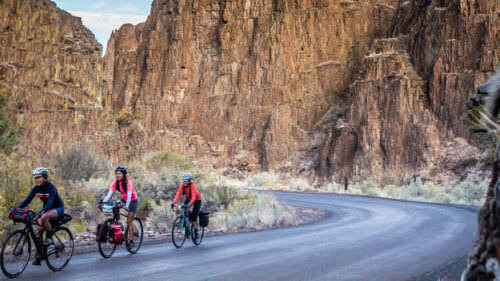 So when I heard about the 134-mile Willamette Valley Scenic Bikeway, the first of its kind in the U.S., I jumped at the chance to turn the route into a three-day expedition that would give me the chance to explore my home valley beyond Portland’s borders. I’d ride with my husband, Tony Pereira, a bicycle frame builder who can fix anything; refuel in a flash with a hoppy IPA; and rely on my trusty and stylish Rapha jacket to keep me protected from anything Mother Nature might dish out. Cyclists Lucy and Tony start the three-day trek along the Willamette Valley Scenic Bikeway at Champoeg State Heritage Area. 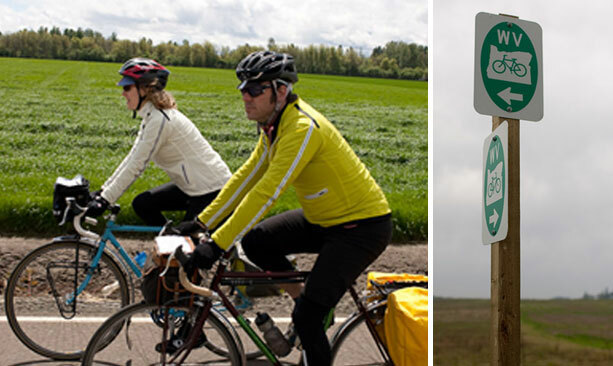 There are green-and-white Willamette Valley Scenic Bikeway signs all along the approximately 134-mile route so riders never lose their way. 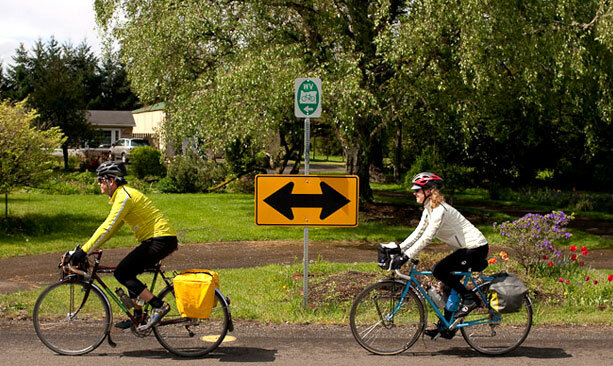 The Scenic Bikeway starts about 30 miles south of Portland, in Champoeg State Heritage Area, the site of a former bustling pioneer town. We mounted our two-wheeled steeds and caught our first glimpse of the Willamette River, which we’d follow south to Eugene. Immediately we saw one of the dozens of green and white “WV” signs that would guide us through the valley over the next three days. In fact we would never miss a single turn, thanks to the signs, plus the maps and cue sheets. We warmed up on flat farm roads that cut through fields planted with hops climbing 20-foot lengths of twine. After stopping at the Willamette Mission State Park to admire the arching pathways through rows of hazelnut and walnut orchards, we continued into the town of Keizer, winding through neighborhoods of bloom-filled yards. We’d been talking about lunch for at least an hour by the time we reached Salem, so we happily dug into tacos, enchiladas and sweet Mexican Cokes at a taqueria. 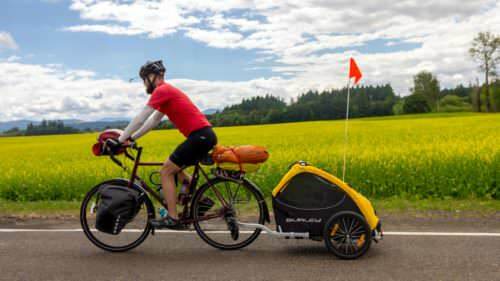 I followed Tony’s wheel along a twisting forested road bordering the rolling Willamette River, past acres of blueberry bushes at Breyman Farms. We vowed to return in August for pints of berries from the roadside fruit stand. After crossing the river on a sweeping bridge we arrived in Independence, a tiny town packed with historic buildings. For an overnight consider the historic Buena Vista House, a small bed and breakfast with garden views in a quiet setting. After a 45-mile day, you’ll enjoy the hearty American pub fare at the Independence Grill. A friendly labrador is the mascot at Ankeny Vineyard Winery where they’ve grown pinot noir and pinot gris grapes since the 1980s. The 2006 Hershey’s Red Pinot Noir was the perfect midday reward. 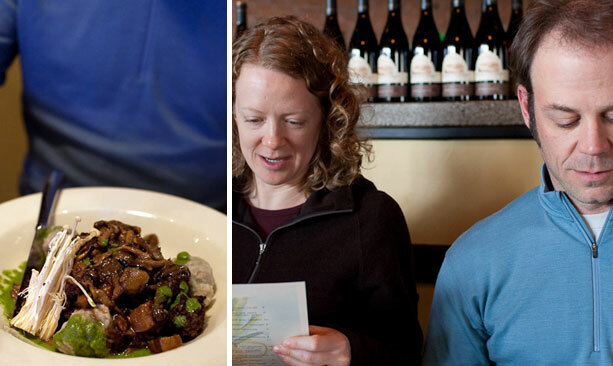 At Sybaris Restaurant in Albany Tony and Lucy enjoy a hearty dinner of crisp salad, braised beef cheeks, cassoulet and a few glasses of red wine. Gear up for the 33-mile day with a big breakfast at the Buena Vista House Cafe or the Pink House Cafe. Knowing there were 50 wineries within 20 miles, Tony and I had to wander among some vines. We decided to hit Ankeny Vineyard, which is located directly on the bike route seven miles south of Independence. 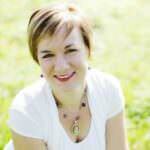 Ankeny has grown pinot noir and pinot gris grapes since the 1980s, a fact we learned in the tasting room. The juicy 2006 Hershey’s Red Pinot Noir, for just $12 a bottle, made me want to add some weight to my panniers. We rode onward, soaking up the solitude on the nearly traffic-free route, to the Ankeny Wildlife Refuge, where flocks of dusty Canada geese huddled in open fields and the sound of chirping filled the air. 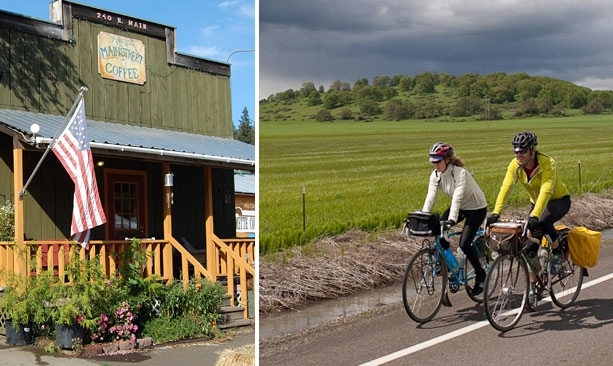 At 64 miles from Champoeg, the small town of Jefferson was the perfect spot for a quick snack and stretch before we climbed into a shockingly green valley overlooking the Coast Range. I took in the view from a postage-stamp-sized cemetery filled with pioneer gravestones. We arrived in Albany, the city with the largest historical district in the state. For lodging, consider the Edelweiss Manor Bed and Breakfast or one of many options listed at the Albany Visitors Association. Our must-stop for dinner was Sybaris, a nearby downtown restaurant run by James Beard Award nominee Chef Matt Bennett, who excels at using local seasonal ingredients in his dishes. After a hearty meal of crisp salad, braised beef cheeks, cassoulet and a few glasses of red wine, we happily called it a day. 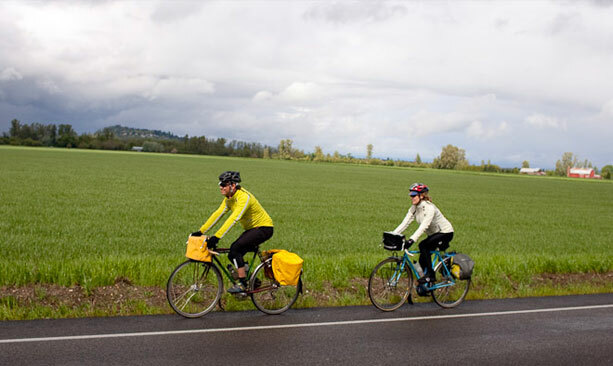 The Willamette Valley Scenic Bikeway rolls through miles of farmland and verdant fields. Fueled by another hearty home-cooked breakfast, we pedaled out of Albany into the farmlands and passed field after field of cotton-ball sheep and cud-chewing cows. Tony suggested we avoid an ominous gray rain cloud by pulling over in a town called Shed — a brilliant idea, as it turned out. We watched the downpour from a covered bench. Once the sun reemerged, we rode west toward the foothills of the Cascades, a rolling barrier that transformed flat farmland into hilly challenges. In Brownsville, Randy’s Main Street Coffee offers thick shakes, big sandwiches and hearty soup of the day. With just 24 more miles to go, we embraced the route’s biggest climb, just south of Brownsville, and then cruised into Coburg, home to a pizza parlor and coffee shop. At last, we pedaled into Armitage County Park — the end of the route and 54 miles from where we began that morning. Because Eugene is only five miles further south, we’d heard many riders continue the journey by riding into town for a meal and lodging. 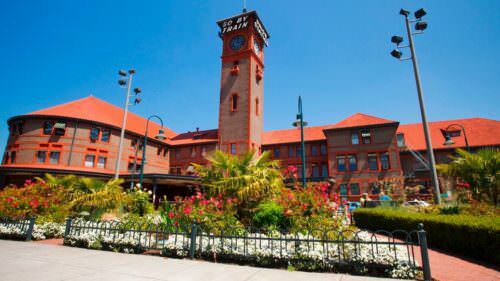 Some opt to take Amtrak home; the Cascades line runs twice a day from Eugene to Portland and bikes cost just $5 to carry on board. But Tony and I decided to act like purists (tired purists), saying that if the WV signs were finished then so were we. We called a friend for a ride. 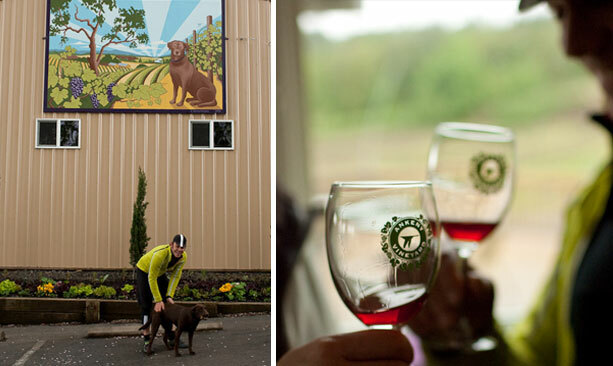 As we dismounted our bikes for the last time, I knew I’d uncovered a few new unknowns about the Willamette Valley. Now I know the sound that hop vines make as they rustle and sway in the sun and that farmers in pickup trucks will always tip their hats at cyclists.